I hope to continue providing great articles and information from Corbin Shell. I have committed to building a special section of our site called "Corbin's Corner" to share his contributions. I have enjoyed reading his material and I hope you do too. Have you ever wondered how factory ammunition compares to handloads? I set out to find the answer. First let me outline what I wanted to accomplish and determine during my testing this week. Is factory ammunition as good as handloads? Bullet drop of factory .17 Remington ammunition with 25gr Remington bullets. Fist off let me give a run down of the components as some might not be following my "series" shooting the .17 Rem at distance. Jewel trigger set to about 8 oz. 40 rounds of each type ammunition were shot and here is what I found. The format I followed for each batch of bullets is as follows. 200 yards- 5 fouler shots on an adjacent target to get centered. 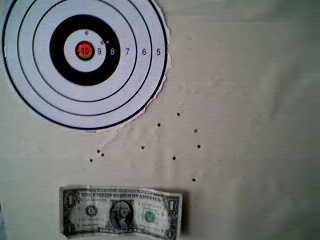 200 yards- 5 shots on blank target 6x6 with small aiming bull at the very top. Above is the target shot at 200 and 300 yards with the factory ammo loaded with 25 grain bullets. Above is the target shot at 400 yards with the factory ammo. NO scope adjustments were made beyond the 200 yard line. NO consideration to wind was made once centered at 200 yards. After firing the 40 rounds of factory ammunition the rifle was cleaned with solvent, approximately 10 patches. No brushing was done. (May have been a mistake). Now lets look at wind drift. I did not adjust for the switching wind flags or mirage. Shot "straight away". As you can see from the photos, wind DOES move bullets!!!!! If you were to drop a plumb line from the center of the aiming bull to the bottom of the target here are the results. Wind deflection is measured from the center of the target to the "Center" of the group. Keep in mind these are averages. 525 yards- 2 shots in plumb. 7shots spread out to right side 13" to middle of group. 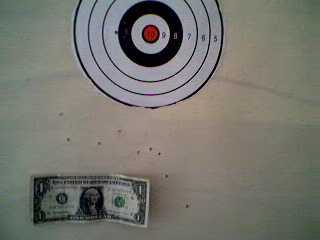 Upon seeing that there was a missing shot I figured the wind had picked up and blew it off the right side of the target. Another possibility was that the bullet did not clear the 400 yard burm as it is fairly high. More on this later. 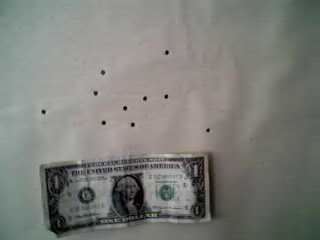 Above is a picture of the 200 yard target shot with 30 grain Bergers in my handload. 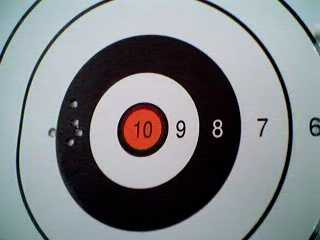 Above is a picture of the group shot at 400 yards with handloads (30 grain Bergers). 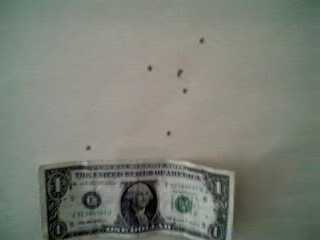 Above is a picture of the groups shot at 200 and 300 yards using the handloads (30 grain Bergers). As the saying goes the proof is in the pudding and the pudding is on the paper. Now back to the question of the missing shots. As best as I can say, those missing shots are due to excessive barrel fouling. I only lost one of the 25gr Remington bullets out of 40 shots. The barrel was squeaky clean before starting these tests. After shooting the Remington bullets the barrel was cleaned with about 10 solvent soaked patches. NO brushes were used. This is where I think the mistake was made. I subsequently lost eight shots with the Berger 30 gr bullets. All lost during the final strings of shooting 400 and 525 yards. I have never before lost a single bullet in this barrel until these test. Currently the barrel has been fired 400 times. It is possible the carbon and copper fouling started tearing the jackets. My conclusions after firing only 40 rounds of each type projectile are some what mixed. For the occasional shooter, factory ammunition will most likely suit all there needs (at least to 400 yards). The factory ammo shoots very flat out to 400 yards and groups fairly well to that distance. Beyond 400 yards I feel it gives up way too much to the heavier 30gr bullet. The 30gr bullet traveling at 3750 fps muzzle velocity drops less at 400 yards and beyond. Drop is significantly less at 500 + yards. Wind deflection is also greatly reduced. One draw back to bullets made with J4 jackets is that they are so thin. Bullet blow ups are something most will experience sooner or later when shooting bullets made with J4 jackets. I will end with an observation about recovered 30gr bullets. Impact distance of 550 yards. It rained very heavily yesterday and the ground was still pretty saturated. I was able to recover two projectiles that were fired at a small target J . Both completely mushroomed and one lost the core entirely.